It’s always a happy month whenever goodies arrive! Thank you to the lovely ladies who sent me these! I received Folded and Hung GCs from Daryl and Andre Chang. Here are just a few of the items I got. Aren’t the belt bracelets cool? Lovely wedges from Renegade Folk! Remember my obsession over shoes’ arches? These are just right! I can’t wait to wear them out! Another photo of the shoes I got from Renegade Folk. Visit their Facebook fanpage and Twitter for more lust-worthy shoes! 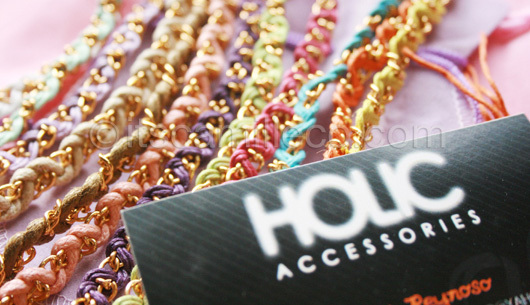 And last but not the least, Golightly bracelets from Holic Accessories. 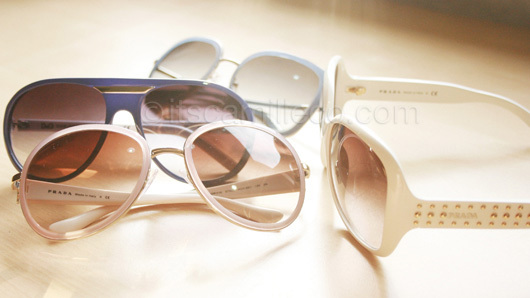 I love that Mitzi, the brainchild behind Holic Accessories, sent a handwritten letter together with the accessories. So sweet and thoughtful of her to add a personal touch! I love letters! A closer look at the bracelets. They’re all handmade, made of wax cord and chains. 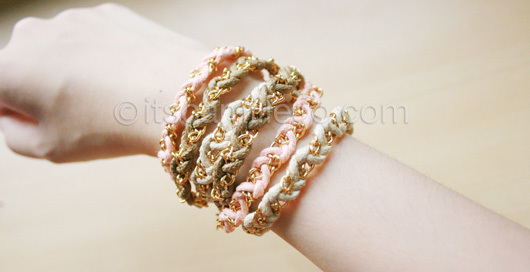 I swear I went wild when I saw these bracelets! Just a little tidbit, Mitzi named the bracelets, Golightly, after Audrey Hepburn’s character in the movie Breakfast At Tiffany’s.